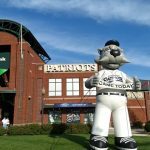 Another Somerset Patriots “Bark in the Park Night” has come and gone. 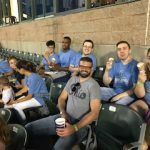 We want to thank everyone who came out to TD Bank Ballpark on July 26, 2017 to share a fun evening with us! Let’s take a look back and share the memories, especially for those who could not make it that night. Owners checked in with their dogs at the special registration table out front, and gates opened at 6 p.m. 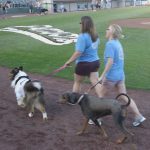 The event kicked off at 6:30 p.m. with the ever popular Pooch Parade around the field. 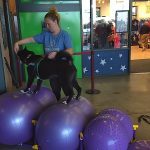 A few of our BMAH team members participated this year with their own canine friends. 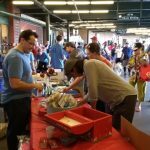 The weather was perfect, and it was nice to see such a great turnout early on of people and their pets! 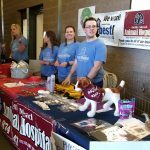 The Belle Mead Animal Hospital team did a great job in the concourse showcasing our services at the BMAH table, offering giveaways to people and pets, and demonstrating canine rehabilitation exercises offered at our new Pet Pain Clinic. 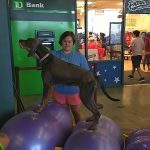 Dr. Kim Somjen who manages the BMAH Pet Pain Clinic was on hand with several of her team members to offer advice and answer questions to interested pet owners. 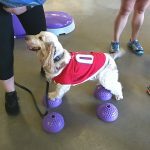 The team brought along their own dogs to demonstrate rehabilitation exercises. 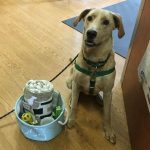 Visitors to our table also participated in a raffle and this lucky dog named Buddy was the winner! 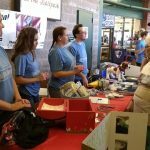 The concourse and ballpark stands were crowded with people and their pets enjoying the activities and watching the game. 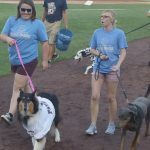 There was the usual break for Yappy Hour where folks could buy their dog an ice cream treat while troughs of water were made available throughout the ballpark to keep the pets hydrated. For those of you who are Somerset Patriot fans, they won that night! 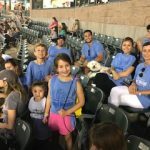 It was a great game with lots of excitement until the end. Thanks again to everyone who came out that night and stopped by our table. 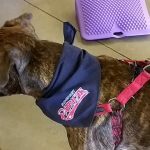 This entry was posted in Events, General Pets, News, Veterinary Services. Bookmark the permalink. ← Final week for Best Contest Voting! 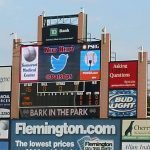 Help Us Win!